Homepage / Fish / How to Feed a Beta Fish and How Many Times a Day? Surely you came to this page because you’re wondering what beta fish eat ? Right? In this article, we will talk about how to feed the fish betas. 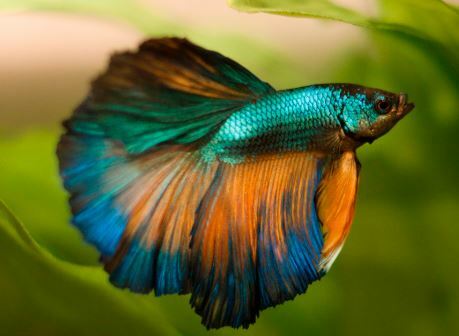 The feeding of the Betta fish is not the most complex, there are fish that need much more care and attention on the part of the breeder, however, it is extremely important to read the present presentation in full so that no detail is overlooked and the animal can, therefore to live with the highest quality throughout their life expectancy. We also recommend that all those interested in breeding Betta fish should read as much relevant information as possible, so that they always have a healthy animal that can respond satisfactorily for all purposes. Before its domestication process, that is, in its phase of full contact with nature, the Betta fish was properly accustomed and adapted to small ponds containing insects and larvae that were deposited naturally on the surface. Perhaps this is a very important feature for understanding your genetics for physical endurance. Over time, and with the creation of these fish in aquariums, such feeding has undergone some adjustments, which we will see below. It is very necessary because in the modern world few would have enough patience and time to feed their Betta fish in the traditional way. What changes were these? Can we guarantee that they have been beneficial to the maintenance and improvement of the species? The industry realized the need to provide breeders with an easier and healthier choice for the fingerlings, because in the old process of feeding craft, together with the insects and larvae, they contained many soils, which was not recommended for them. Thus, they adopted significant changes in the process of raw material collection and selection, aiming the production of a safer product to feed the Betta fish, later, these companies began to manufacture rations with specific nutritional aspects for this fish. Finally, we can guarantee without any doubts that such changes were wonderful for the maintenance and improvement of the species since they started to have what we call super feeding, generating ever stronger and more beautiful generations. After the advent of the rations, another aspect became fundamental in feeding Betta fish: the dosage question! Yes, the dosage is certainly the first aspect to be considered for proper nutrition! This is because it can either be an effective remedy for your health when administered properly or become a poison when applied in excess! Obviously disregarding the lack of food, which everyone already knows will be harmful, too much food is not healthy for him due to multiple aspects, such as: pollution of the environment in which betta fish lives, even reducing the oxygenation of the aquarium, obese animals that have difficulties of locomotion and the high cost provoked by the waste of the material used in the culture. Therefore, always read what determines the manufacturer’s package insert before administering the feed to your Betta fish. When buying a feed for our Betta fish, it is necessary that it can guarantee the minimum nutrients to its survival and development, so never believe first in the conversation of the seller, observe the brands of rations that will be offered. To be sure of the quality of this product, just buy branded labels from the health ministry and clear contact information (phone, email and mailing address). In addition, they should also contain clear information on digestibility and other essential components of quality rations, such as fiber levels, minerals, vitamins, and even fats. Give preference to those containing chelated organic minerals and without the presence of artificial dyes! After giving the food what should I do? After verifying the ideal daily quantity indicated by the feed manufacturer (information on the product label), it is important to make sure that the feed does not get degraded in the water for a long time, so be sure to offer it to the Betta fish by at most five minutes! After that time collect the residue with one of these little rounds for the aquarium. Bettas must be fed once a day! Can Betta fish only eat ration? Not! The ration is only the main food of this type of fry, but with some knowledge, it is possible to give other foods to the animal. Among which we can mention: seaweed, artemias, worm Glycera, Grindal worm, Californian worms, shrimp (small), frozen ox heart (abundantly found in any store that sells Betta fish), etc. Ideally, you can feed it every day, yet they are also extremely resilient! So make sure you feed it properly in the last five days and make your journey without fear, knowing that it will last well for little more than a week without food.